Holiday-themed movies have always been a bit of an iffy area in horror. Aside from Halloween, which naturally lends itself to horror stories, the majority of holidays haven’t inspired much greatness in the way of horror cinema. From Leprechaun, to April Fool’s Day, to Uncle Sam, to Thankskilling – for the most part, holiday horror movies are just sort of there to laugh at when the appropriate holiday rolls around. Because Christmas is arguably the biggest holiday of the year (even for non-Christians, who are nonetheless forced to suffer through the interminable shopping season), there are a few more options to choose from, but the pickings are still fairly slim. For decades, horror fans have had to satiate themselves with viewings of Gremlins and Black Christmas, year after year, as nothing better ever seemed to come along. Not that those aren’t excellent movies; but you’d think that someone would have made at least one equally good Christmas horror film in the 30+ years since those movies came out. 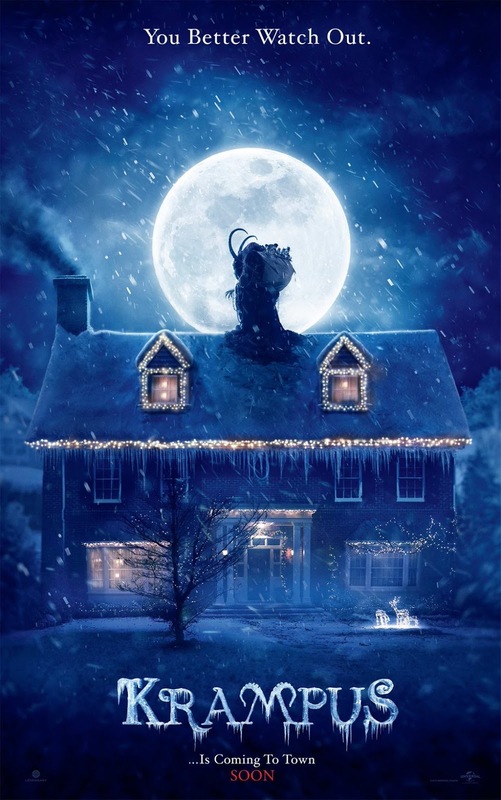 This is the part where I tell you that Krampus, the latest offering from Trick ‘r Treat director Michael Dougherty – celebrated by horror fans the world over – is the greatest Christmas horror movie to be seen in decades. Right? Well… sort of. Not exactly. But kind of. I’ll spare you the details of Krampus’s plot, because if you’re reading this blog I’m guessing you’ve already been following the hype of this movie for a while now. Trick ‘r Treat is widely considered an instant classic and genre staple, so it was exciting to hear that Dougherty had another holiday horror movie in the pipeline. In many ways, Krampus is every bit the film I hoped it would be. In other ways, it doesn’t – and perhaps shouldn’t be expected to – live up to the high bar set by Trick ‘r Treat. After all, that standard exists only in my mind, and is most likely an unfair one. Let me start with everything Krampus does right – and that’s a lot. The cast is roundly impressive and likeable (even the redneck relatives are loveable when it counts), with Krista Stadler being a standout as Omi, the grandmother who knows the dark history of Krampus. Even the child actors are winning, from main character Max to mouth-breathing Howie Junior, the kids are all entertaining, if mostly one-note. As a blizzard sets in and the situation escalates, the actors do an excellent job of making you care what happens to them. Unfortunately, the plot undoes that hard work to a certain extent… but I’ll get back to that in a minute. Something I trusted Dougherty would bring were the special (and practical) effects, and bring it he did. Krampus is simply a wonder, from the way he is revealed – leaping from one suburban rooftop to another in the misty snow with the force of an earthquake – to the slow pan from his giant hooves to a chain-laden cloak seen from beneath a car, to the horror of his grisly face, Krampus is all that one could hope for in a Christmas nightmare. And then there’s his army of minions: murderous gingerbread cookies that happily bring to mind Gremlins, a jack-in-the-box truly from hell, and “elves” that look like they were plucked straight out of a Greek tragedy. The effects here are on point, to say the least, and are often quite frightening. But there were disappointments, as I suppose there were bound to be, what with the high hopes I’d been harboring. My first quibble is a small one, but I found the jokes annoyingly hit or miss. An opening montage of Black Friday shoppers battling it out in slow motion to the tune of “It’s the Most Wonderful Time of the Year” is perfectly scathing and timely, and a great way to introduce the main theme of the movie. When the rightwing, redneck relatives show up at the uptight liberals’ house for Christmas dinner, however, the gags rest heavily on broad, stale jokes, and more discouraging, jokes that outright mock the young characters for being fat and ugly. I’m not one to shy away from some nasty humor, believe me, but many of these supposed witticisms were outdated and undercooked. The bigger complaints I had will surely depend on whether you go to see Krampus because you love horror, or because you love Christmas. Gore is basically nonexistent in Krampus’ world, despite that the demonic creature is constantly yanking people away under the snow, accompanied by ghastly (and seemingly irrevocable) crunching noises. And that’s a real problem; although Omi sets the stage by giving us the folklore of Krampus, we never find out exactly where he’s taking the people he drags off under the snow. Are they being killed? And if so, are they then taken to Hell, or somewhere else? This lack of parameters, and the quickness of the characters’ picking off, has the opposite effect of what I think was intended. Rather than feeling all hope is lost, the audience gets the sense that there must be some loophole that will save everyone in the end. Then there’s the ending. Without spoiling it, let me just say that the ending can be read in a couple of ways, both of them somewhat clichéd (though I’m partial to one over the other, and as a horror fan, you’ll probably be able to guess which one). Multiple fake outs result in an ending that’s more jumbled than shocking, an ending that just sort of tapers off when it should’ve ended with a bang – or at least something not so wishy-washy. It feels like Dougherty was trying to please both the horror crowd and the family crowd, to poor effect for at least one of those factions. Perhaps he will please the parent who takes their ten-year-old to see it, and that’s fine. Krampus is probably the kind of movie that would have terrified and thrilled me as a child. Whether Krampus will end up on rotation year after year for adult horror watchers, however, remains to be seen. I deeply enjoyed parts of it, and it’s certainly the best Christmas horror film I’ve seen in quite a long time, but I’m not sure it has what it takes to endure years of viewings and be labeled a classic. “Instant classic” is, of course, a perilously high bar to set, and the comparisons to Trick ‘r Treat are made all the more difficult because Halloween is a pagan’s holiday, tailored-made for the horror genre. It’s meant to trick and treat, whereas Christmas has always solely delivered treacle-sweet messages of love and morality, making it hard to break the mold and deliver a sellable movie to theaters during the holiday season. Dougherty was clearly going for widespread appeal and a PG-13 rating with Krampus, two things that were happily absent from his earlier work. But in straddling that line of pleasing the holiday industrial complex and delivering something more, I think Krampus leans far to the side of settling. The savage bite of Trick ‘r Treat is what is lacking in Krampus; aside from the broad-strokes conservative/liberal jokes and the fat kid/lesbian jokes – which will, yes, have twelve-year-olds and Tea Partiers rolling in the aisles – there is very little that is subversive or edgy about Krampus. At its heart, it is a movie that by all measures appears to be a throwback to the Christmas movies of old, from A Christmas Carol and It’s a Wonderful Life, to National Lampoon’s Christmas Vacation. And those are great movies, but they’re not horror films. They’re not beholden to anything other than a happy ending. Call me crazy, but I think horror fans can be some of the most discerning fans, and I think we demand more than straightforward moralizing. Perhaps Dougherty was trying to give horror fans that something more at the very end, but I found it to be too little, too late. …But I’m being harsh. (It’s only because I love Trick ‘r Treat so much, man.) Krampus is a wild, mischievous, very enjoyable flick. It’s a bright spot in the horror wasteland that typically is December. I fully recommend that you go see it. But the fact remains – and oh, how I wish it didn’t! – I wanted more.